Okay guys! I’m fresh from the Hirez Cocktail paty, where I hobnobbed, drank entirely more than I should have, and played both Smite Tactics [which I already had access to] and Smite Rivals! That one’s new, and we couldn’t talk about it until just now. The name had sort of been spoiled on the Internet, because people are awful, but we got to be among the first to really play it outside the office, and that’s exciting. 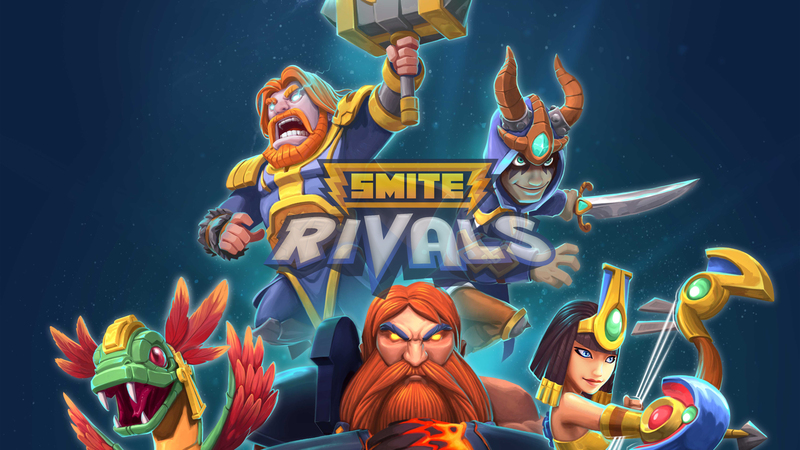 So, what’s Smite Rivals? It’s a mobile title [and PC as well I do believe], that will be fast-paced and absolutely a ton of fun. It’s a cute version of Smite, where you have a deck of charcters/totems/towers/abilities, and each God plays a bit differently. The goal is to summon characters/minions to run down the lanes to blow up the towers and the Titan, much like a regular game of Smite except with everyone rocking a chibi-Hades inspired skin. But his game, barring need for a sudden death, takes place over the course of about two or three minutes. You have a mana bar that constantly fills, and a button to activate faster mana regen [on a cooldown], and you place the creatures and spells where you want them. You can hover over them to see what they do, but you won’t really have time in a regular game. I highly recommend learning your stuff before going in as the pacing is hectic and unforgiving! I played the Hades, Thor, and Neith decks, and each felt considerably different. I haven’t had that much fun on a tablet/mobile game in quite some time. It’s reminiscence of a Smite version of Minion Masters, which is a game I thought was fun on its own. And Smite Tactics continues to grow and be fun. I don’t really need to say much about that yet, but I’m going to in a future editorial/write up. You can be sure of that. I did learn that I’m bad at any tactics style game while inebriated though. The other big reveal is the next God, the first Celtic God: The Morrigan! She’s so insanely good! Oh my God. I’m not going to do a big breakdown of her kit, because I’ll be doing a review of her before long. But she’s got a crazy fun stealth a’la LeBlanc, and lots and lots of damage and team synergy. But the best thing is her ultimate! She’s at heart sneaky and manipulative, and what better way to drive that point home, than by becoming another God on the team [friend or foe]! You get their full kit, their stats/items, but no consumables, you use your own relics, and your stolen abilities will be leveled at the equivalent level of your own 1-4 skills. If you activate their ult and its longer than her ult cooldown, it increases the cooldown of her ult. So you really have to plan ahead what you’re going to do with it: whether you want to trick their backline, or simply add another ludicrous ult to your teamfight… The Morrigan is going to be my next mage to play regularly. I guarantee it. Hirez is going hard this year, and definitely dropping a ton of amazing content all at once. Two new games in Tactics/Rivals, lots of fun updates to Smite, and Paladins being just amazing now – we’re not even at the start of the tournament!